At eatzCatering, we are always catering Singapore clients so we believe in providing the best of what the Singapore culture has to offer. You will find that many of our catering packages are themed around dishes from local cultures in Singapore. The Peranakan cuisine is one of the cultural cuisines that we cater for. The Peranakan is a group of people belonging to a mix of Chinese, Indonesian, and Malay heritage who settled in Southeast Asia. It was thought that many Peranakans came from a line of ancestors that are Chinese traders who married local women in 15th-century Malacca. The term “Peranakan” actually means “local born” or “local descendants” and it is a label they gave themselves to differentiate between them and the newer immigrants of the 19th century. According to Peranakan culture, Males are called Babas and females are called Nonyas. So what do you get from a fusion of three different cultures well-known for their flavourful delicacies? The famous Peranakan cuisine of course! Although the Peranakan have been assimilated into a larger Chinese community, much of the Peranakan cultural values have still been retained. The most prominent part of the culture is, of course, the cuisine. 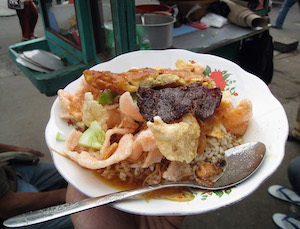 It is called Nonya food and is named after the ladies because they were the ones who usually did the cooking. The cuisine is a combination of Indonesian, Malay and Chinese influences. The most common ingredients used in Peranakan cooking are coconut milk and rempah (Malay word for spices). Signature Nonya dishes are Ayam Buah Keluak which is braised chicken, spicy tamarind gravy cooked with the Buah Keluak nuts and lastly the beef rendang which is beef stewed in coconut milk and rempah. Other than this, they have special sweet cakes too which are called Nonya Kueh. Peranakan culinary skills were one of the biggest accomplishments among the people and Nonyas were always expected to have inherited a full arsenal of recipes and cooking skills. 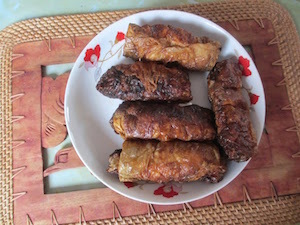 Loh Bak / Ngoh Hiang: It is prepared from the beancurd skin which is wrapped over assorted meats like chicken. Nonyas do not believe in wasting food so they are efficient in using any ingredient to make different dishes. 5-spice powder is added to create an exotic flavour and aroma to make the chicken even more delicious. Nasi Ulam: It is a dish of rice and raw vegetables. It is one of the traditional dishes. Rice is combined with different spices, and herbs and some other ingredients are added too like turmeric, shallots, shrimp paste and kaffir lime leaf. 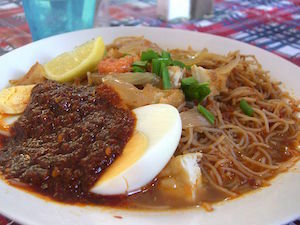 Mee Siam: “Mee” in the name actually means noodles in Malay and “Siam” actually stands for Siam, as in the former name for Thailand. Mee Siam is a spicy vermicelli dish that was inspired by dishes from Thailand. It consists of thin vermicelli served in gravy that is a mix of spicy, sour and sweet. The gravy is made out of rempah, shrimp, tamarind and salted soy beans. 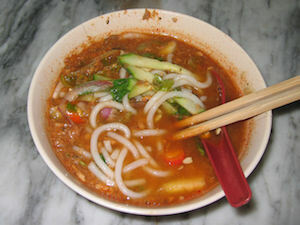 Assam Laksa: This version of Laksa is pretty different from the usual Singaporean one we have. The gravy is filled with fish stock, tamarind (Assam in Malay) and other herbs and spices giving Assam Laksa it’s unique sour taste. Main Course: Nonya Chicken curry with potatoes, ayam masak buah keluak, sweet and sour fish, assam fish fillet with pineapples, sambal belachan fired rice, salted fish fried rice and bean sprout, banana leaf nonya fish otah, nonya chap chye and mushrooms. 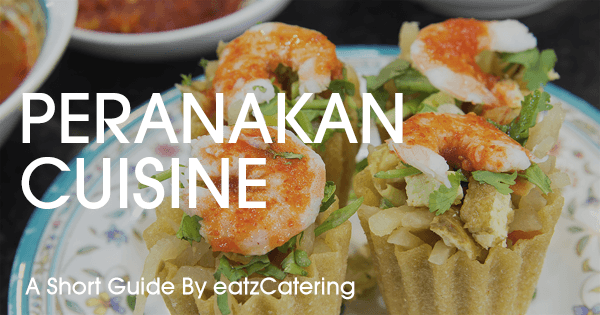 If you are throwing a Peranakan-themed party or event, contact us to experience freshly cooked Peranakan food that will remind you how your Nonya Bibik used to cook your favourite dishes.